You may have been out of school for 10, 15, or more years and you feel that you will not do well because you have lost touch. What you should realize is that now is the perfect time to go back to school. Why, because you have a desire. In our teenage years and young adult years, our mind may not have been as settled as it is now. We were more than likely focused on the pleasures we thought life could bring. As we get older, we tend to say, “If I knew then what I know now, I would have done this or that.” Now that we are older, we know what is best for us. Therefore, we know the importance of a good education. Most good paying jobs will not consider an application or resume if a certain level of education is not listed. The most important reason you should go back to school is because once you get your education, it is yours and no one can take it from you. Learning is fun, especially when you find something you are interested in and when you have a desire to achieve what you think is impossible. Achieving a higher education will put you in positions you never thought of. A little knowledge here, a little knowledge there and you will be on you way to heights unimaginable. You may want to start your own business, or partner with a fellow classmate. There is no limit to what a good education will bring. Think positive and remember, if there is a will, there is a way. If you will to get a better job, if you will to increase you knowledge, if you will to excel, Education is the way. There is no need to be intimidated by the number of younger students that will be in the classes with you. They may be willing to help you in certain areas. Why am I so adamant about going back to school and getting what you deserve? Approximately 17 years after I graduated from high school, I went back to school and became certified as a nursing assistant and phlebotomist. After my phlebotomy training, I obtained two (2) back-to-back degrees of associate in applied science. The first degree I obtained is in Office Systems Technology/Medical and the second in Computer Programming/COBOL, RPG, and VB. I am a single parent and I obtained the majority of my education working a full-time job. Close to the end of my schooling, I also had to care for a very ill family member who later passed away. I have a good job now and am getting ready to partner a business. If there is a will, there is a way. So, what are you waiting for? Go back to school so that you too can reap the benefits of a good education and reach your dreams. Kay Jones has completed studies and earned the degrees of Associates in Applied Science Office Systems Technology with a concentration in Medical and Computer Programming with a concentration in COBOL, RPG, and VB. 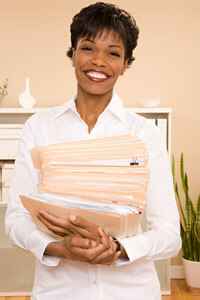 She can be reached at kwhite91@netzero.net or her business address at www.appliedskillscenter.usclargo.com.